Kitchen cabinets are used very often. Because they occupy a large space, they more exposed to elements that can reduce their quality. However, kitchen cabinets are less taken cared off as compared to other kitchen ecuipment. During the cleaning, they are often left out unattended. Keeping kitchen cabinets in their perfect look requires regular cleaning and wiping. Wiping a clean cloth can help maintain the original look of the cabinet doors for a very long time. Door knobs should be cleaned as well. Welcome to New Kitchen Cabinet World!!! New Kitchen Toronto specializes in design, manufacture and installation of custom made cabinetry and all aspect of kitchen and bathroom remodeling at affordable prices. With our 25 years of experience and hundreds of satisfied customers in the Toronto and Greater Toronto Area, we can guarantee, you will be completely satisfied with our honesty, customer service, quality, and prices. Whether you are simply refacing your kitchen, refreshing the outlook, preparing to sell your property or planning an entire home renovation and remodeling, New Kitchen Toronto may offer you a range of affordable solutions. Let New Kitchen Toronto guide you through the process of creating beautiful and functional cupboards for any area of your home with best craftsmanship possible and your budget in mind. Dmitriy Rozenberg is the General Manager at New Kitchen Toronto. He began his career as a quality home renovator in 1986 after graduating from university as a Civil Engineer. 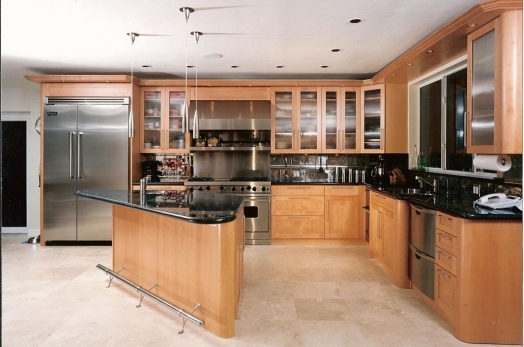 In 1987 he began making custom cabinets and doing his own millwork for his projects. From 1991 he was specializing exclusively on custom cabinetry and woodworking. Under his supervision New Kitchen Toronto designs, manufactures and installs cabinets with exceptional quality and highest attention to details. We use a wide variety of Canadian-manufactured cabinets, countertops, components and accessories that, together with our craftsmanship will ensure your complete satisfaction with the project. We offer any product or service that exists on the woodworking market today at affordable prices. Welcome to New Kitchen Toronto World! We will happily assist you with any type of renovation or new construction, and will provide all the support we can at any stage of the project. Small improvement or extensive remodeling, any type of project from "A to Z" or just a part of it: only design or just installation or just manufacturing for self-installation we do it all. You can ask us to design yours cabinetry and go to get them from any other supplier. You can buy cabinets from IKEA or HOME DEPOT - let us install them! We can only manufacture cabinetry for you in accordance to your or our design and let you to install it. If you have any problem for any reason at any stage of yours remodeling, we are here to help.